We love beans and so, I always try to add as much as beans to our daily menu. I had frozen Indian field bean (Mochai) in my freezer. So, I used long beans and Field Bean along with Moong dhal to make the dish much more healthier and tasty. This healthy side dish goes good with any rice or chappathi. 1. Cook chopped bean, Field Bean and moong dhal with salt in enough water. 2. In a pan, add oil. Heat it. 3. Then pop mustard. Add urad dhal and red chillies. 4. Add the cooked vegetables. Mix well. 6. Switch off the stove. Add grated coconut. 8. Serve with rice/ Chappathi. This makes it's way to MLLA # 25 hosted by Siri, an event started by Susan. Delicious and healthy beans poriyal. Delicious and yummy poriyal !! 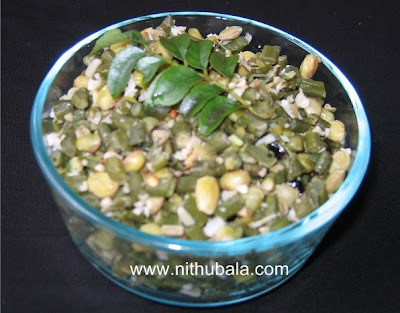 Delicious and very new combo, such a nutritious poriyal Nithu.. Healthy and nutritious beans poriyal! porial looks gud..will try it soon nithu. I love beans poriyal. This looks so good.